Jon Hamm | Please visit the new site at TelematicDan.com! Please visit the new site at TelematicDan.com! MAD MEN NEWS: Season 4 begins July 25 and AMC denies the show will end after Season 6! Is this a HOAX? Here's where we left off. IT IS COMING! For the fourth July in a row, the greatest television series on Earth returns to lay waste to our Sunday nights with its wit and brilliance and genius and style and darkness. If you’re a fan, the anticipation is killing you. The questions abound. What year will it be? Will Don and Betty be divorced? Will Betty still be with that Henry Poole dingus? How will the Sterling Cooper Draper Pryce agency be doing? Will Pete have been made partner? Will his tennis shorts have lengthened? Will Sal still be trolling for rough trade in the Lambda Lambda Lambda section of Central Park or be back home, settled snugly with his no-longer-clueless wife Kitty? Will Guy the Brit wonder get his other foot chopped off by some sort of lawn maintenance machine? But that’s not the only big Mad Men news to drop in the past 24 hours. The story goes that Matt Weiner announced at the NAB convention that the show will end after its sixth season in 2012. But the only source for this story was the wordpress blog weeklyblend.com, and the article in question is riddled with typos and grammatical errors, thus leading one to wonder about its legitimacy. But even that statement sounds like a fake! Stay tuned, because methinks there may be more to this story. Related story: Christina Hendricks’ Letter to Men in Esquire (photos). How did I miss this? Jon Hamm as Lex Luthor. Seen this? Is it just me that missed it? Pretty funny. Click to go to video on FunnyorDie.com. *Reason for the link: WordPress won’t allow embeds from funnyordie.com and I couldn’t find this on youtube. 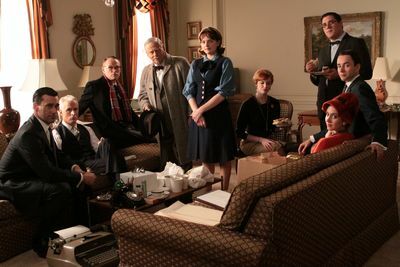 Mad Men Season 4 Cast Photo Revealed! FX renews ‘Justified’ for second season! Please visit the new site at TelematicDan.com! · Reviews, Analysis, Humor and Reporting on Television on the ground in Hollywood.